The life of the humble peasant classes was the principal theme in the work of Adriaen van Ostade. 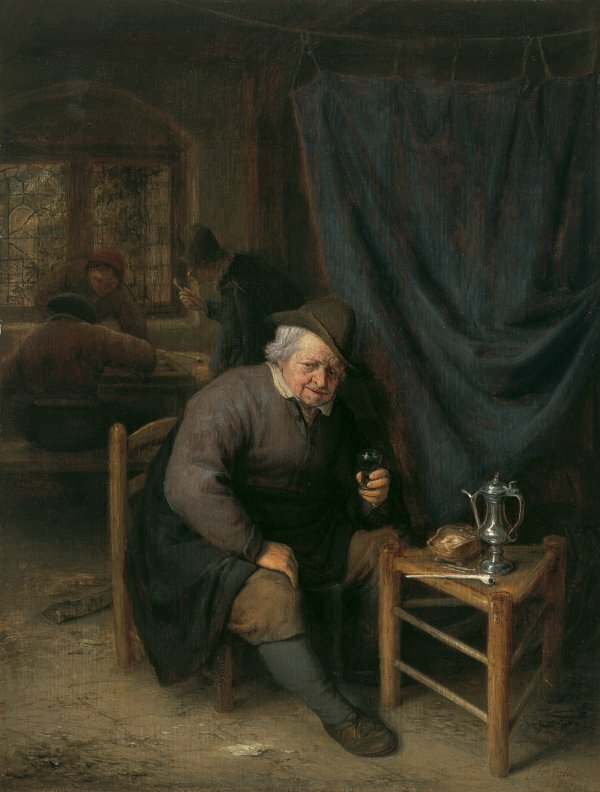 Taking his starting point from models developed by the Flemish artist Adriaen Brouwer and using interior settings conveyed with a limited palette and strong contrasts of light and shade, Van Ostade depicted boisterous figures drinking and smoking in tavern settings. His surviving output is large and comprises a sizeable number of signed and dated paintings as well as drawings and prints. As a result, it has been relatively easy to reconstruct his career. The present panel dates from 1661 during his mature phase, a year before he became the dean of the St. Luke’s Guild of Painters in Haarlem, having occupied the position of hoofdam in 1661. Despite his relatively limited subject matter his works, which are painted with a high degree of technical skill that is evident until the end of his career, evolve with regard to technique and composition, as do the poses and movements of his rustic subjects. In the present panel Van Ostade uses the light to focus our attention on two points in the composition. He highlights the figure seated in the foreground, illuminated from the left, and the group playing a board game in the background around a table. The latter area is illuminated by the light entering through the large window with its lead-framed panes. In the 1660s Van Ostade abandoned the rowdy compositions of his early years in favour of interiors with a reduced number of tranquil figures painted with a painstaking technique and soft chiaroscuro. He paid increasing attention to the numerous details included in these compositions such as the fine still life on the low triangular table which includes a pitcher and pipe. The colour range used for this scene of daily life has a predominance of ochres and browns combined with striking touches of blue, green and grey used for the figures’ clothes and the worn curtain that divides the two areas of the tavern. In this tavern scene Van Ostade depicted some of the leisure activities of the humblest social classes such as board games, drinking and smoking. The backgammon board on the table in the background is the focus of interest of the three figures in the window, along with their tobacco and drink, while the seated figure in the foreground is also depicted smoking. It seems that brandy was a new and cheap alcoholic drink at the time, and it has been suggested that activities such as drinking and smoking were responsible for the end of a golden age, while playing games indicated a reliance on chance as a major factor in life. The present panel has been related to a drawing in Düsseldorf and to an oil formerly in the Charles T. Yenkes collection. The latter has a similar figure to the one seen in the foreground of the present panel.